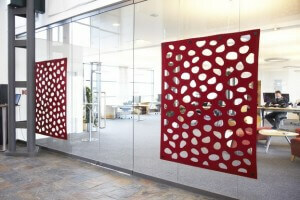 As a fitting finale for our April series on beautifying the office, ProProfs.com provides this timely office design quiz. Fortunately, we got almost every answer right on the first try—we’ve been studying hard! There were some very telling tidbits of information and a few surprises tucked away in this quick true/false test. Here are some facts the answer key revealed (based on results from a variety of different studies). More than 8 out of 10 employees agree that their work environment has a big impact on their level of motivation. 7 out of 10 personalize their workspace in some way. Employees consistently rank privacy as the most important aspect of their workplace—even more important than lighting and temperature control. 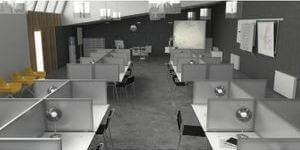 Workers in offices with fewer enclosures (open offices with no or low cubicle walls) report more fatigue and other physical complaints. Employees leave their workstations more often and have lower productivity when there are no panels. That’s very interesting! It’s probably one reason why screensavers and motivational posters showing gorgeous outdoor scenes are so popular in the cubicle world. Employees shut away from exterior views crave a more beautiful environment. 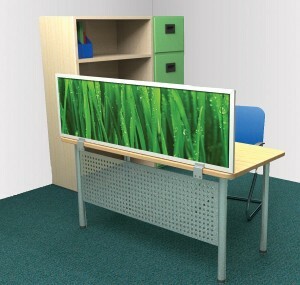 You could turn your office environment into a walk-through gallery with nature scenes on panels gracing each workstation. This solution might be ideal for interior office spaces where most employees simply aren’t fortunate enough to have a seat by the window. Last week, we looked at some strange office furniture. But at least most of it looked like something you would want to use. This next collection is a little creepy. Mati Karmin from Estonia has taken “upcycling” to a whole new level with steel naval mines from an old Soviet fortress. 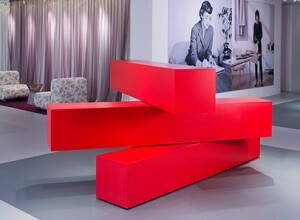 This modern sculptor used ancient ordnance to serve as the skeleton for office furniture that is anything but ordinary. The decommissioned radio on the writing desk probably doesn’t actually work as an intercom, but it would be funny if it did. We’re sure the steampunk fans in the audience will get all kinds of cool ideas from this odd collection. The rust and bolts give it that old-time feel – and the curving shells have a certain cold elegance. Does this office furniture make you feel uncomfortable, or do you think it’s the bomb? Let us know in the comments. To finish up our July blogging, it’s time to relax and play a game of “what if?” For example, what if you could choose any furnishings in the world for your workplace? Would you gravitate toward wonderfully weird office furniture? Would there be any pricy and pompous pieces in your collection? Here are some of our favorite silly and one-of-a-kind picks from around the world. Where do you even begin with the delicious wackiness of Google, London? From floor to ceiling, the new offices are off-the-wall with color and action. 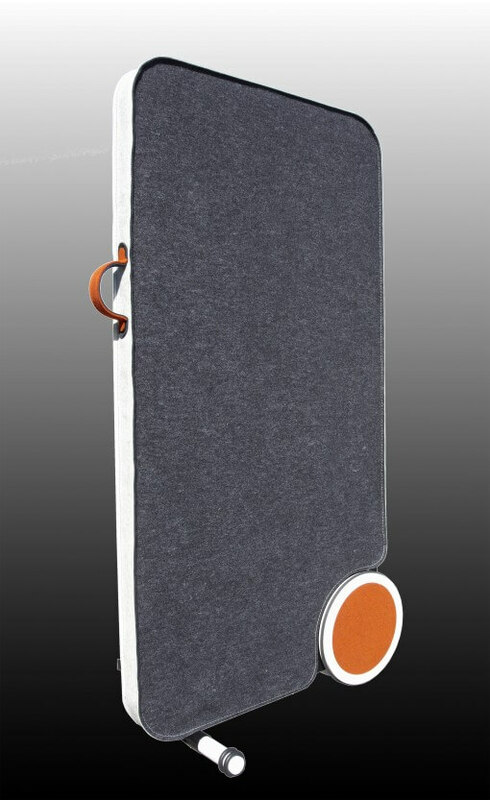 But we’ve chosen to highlight a particular office accessory that really “shines a light” on how this hippest of employers is greening up its image. 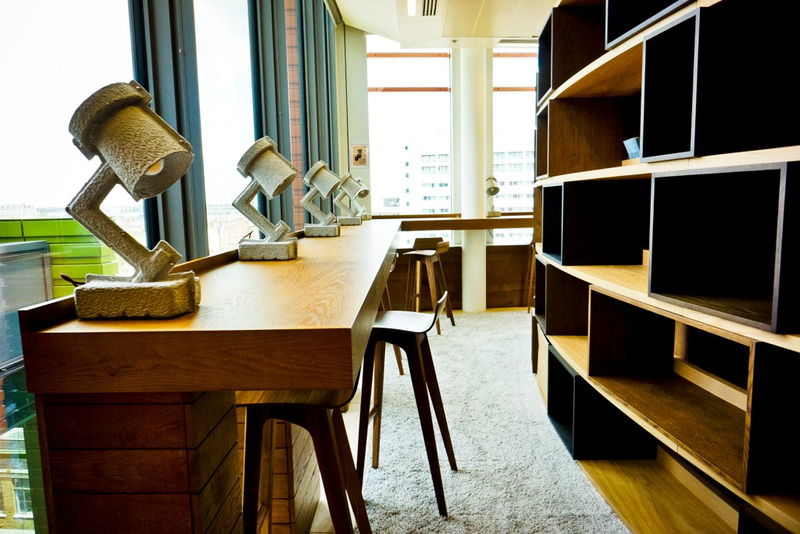 The task lamps in these workspaces appear to be made out of recycled cardboard or paper pulp. We’re betting they have LED bulbs too. The incandescent ones get so hot they might torch these trendy and eco-friendly shades. Rose City Office Furnishings has collected some strange office furniture that makes you feel like Friday all week. The Surf Chair brings your monitor and keyboard down to ground level. No matter what your day throws at you, there’s always the comfort of knowing that you can click over to YouTube to surf your cares away. What’s in a (Swedish) Name? From Arnold’s Office Furniture comes a post poking fun at the cheap yet trendy office furniture everyone loves to complain about: IKEA. The assembly instructions are apparently as difficult to comprehend as the names. This blog is all about the odd names chosen for IKEA’s collection. If you ever wondered what Lanarp or Hemnes is, click here. We’ve got to end up with this idea because it’s a really odd way to go about providing noise privacy for employees. These workspaces have wooden surfaces equipped with Plexiglas domes. Each one houses a clerk working at the office of PONS and HUOT in Paris, France. While it certainly is a novel way to limit the intrusion of phone conversations into the surrounding space, it doesn’t provide any visual privacy. Plus, it’s unlikely that the plastic absorbs much sound. It could get pretty loud inside your bubble!